Minneapolis-based artist Rachel Breen is probably best known for her work with textiles, which she finds funny, since her connection to her sewing machine was purely accidental. From there she started to “draw” with an unthreaded sewing machine. The Price of Our Clothes Exhibition: “Topography of Globalization.” Photo by Renee Yamada. She has since done a lot of work exploring that mark through the repetition of dots, working with fabric and paper. Then, in 2013, the eight-story garment factory known as Rana Plaza in Bangladesh collapsed, killing 1,135 and injuring approximately another 2,500. This moment marked a pivotal change in Breen’s work. She explains that her intention isn’t to conflate herself with these garment workers—she is acutely aware of her own privilege and her very different life circumstances—but as a Jewish woman who grew up haunted by the history of the Triangle Shirtwaist Factory fire in New York in 1911, one of the deadliest industrial disasters in American history that killed 146 garment workers (primarily young Jewish and Italian immigrant women), the garment factory collapse in Bangladesh hit especially close to home. She was so impacted by the tragedy in Bangladesh that she knew she wanted to make something in response to it, though she didn’t yet know what. She connected with local poet Alison Morse, who was equally interested in the event for many of the same reasons. They wanted to create something that paid homage to the deceased while also honoring the survivors and highlighting union organizers fighting for safer working conditions in the factories. So much art and writing has been done about the Triangle Shirtwaist Factory fire, and that event directly led to significant workplace safety laws that have protected and benefited millions since. Yet all that was known about Rana Plaza, at least in America, came from just a few articles that appeared in the news. So Breen and Morse went to Bangladesh and interviewed survivors, people doing union organizing with garment workers, and people doing worker safety education. Breen wanted to find the best medium to visually represent and do justice to the stories people told her in Bangladesh. The best medium, she determined, was hundreds of white shirts. The Price of Our Clothes Exhibition: “Shroud.” Photo by Renee Yamada. 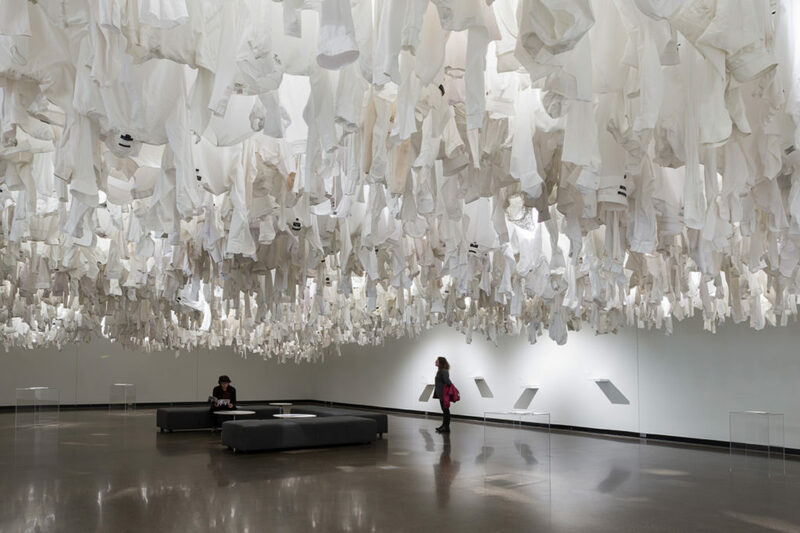 Her idea was to create an installation of 1,281 white shirts—the number of people who died in both factory accidents combined. Just because this tragedy happened on the other side of the planet doesn’t mean it’s not part of our story, she says. They make our clothes, so it is part of our story and our history, as is the way garment industry workers have been treated so horribly for such a long time. Breen chose the color white because both Jewish and Bangladeshi people bury people in white; it’s a symbol of death and memorial. 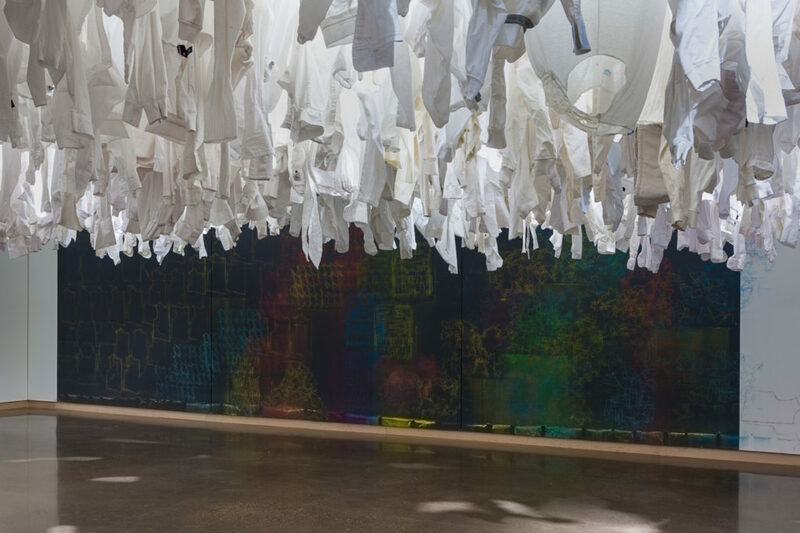 All of the shirts in the installation, called Shroud, were bought second-hand at a Goodwill Outlet, where everything is sold by the pound and it’s the last stop before the clothes go to a landfill or get shipped overseas. 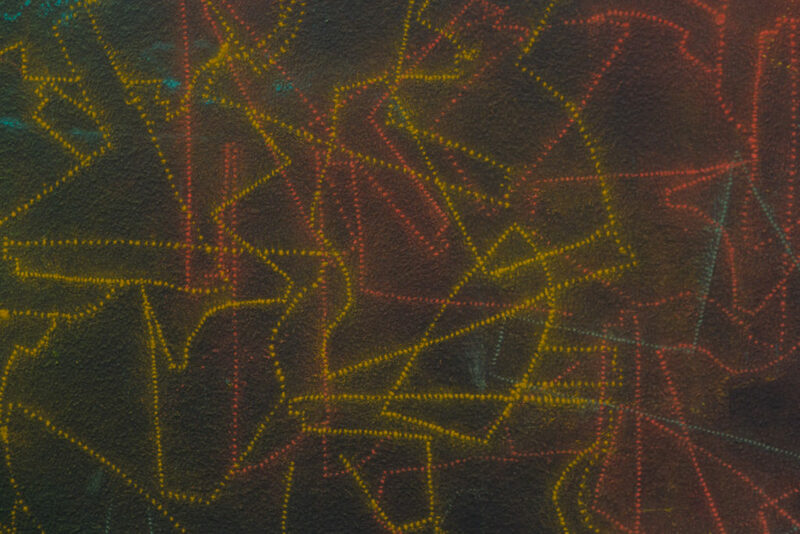 Another piece of the exhibition was an 11’x36′ wall drawing, Topography of Globalization. Stencils were made on unthreaded sewing machines tracing outlines of scrap fabrics Breen found piled up outside of garment factories in Bangladesh. The Price of Our Clothes Exhibition: “Shroud” and “Topography of Globalization.” Photo by Renee Yamada. The full exhibition, The Price of Our Clothes, was displayed last year at the Pearlman Teaching Museum at Carleton College in Northfield, Minnesota. It also included accompanying poems by Morse. Another project that was prompted by the Rana Plaza collapse was the Garment Solidarity Project. For this project, Breen sewed and wore the clothes that the Bangladeshi garment workers (all women) wear—a long tunic with loose leggings called shalwar kameez. She says it was a symbolic gesture and a way to have conversations with people. She sewed these items in public spaces like farmers markets and community festivals—nontraditional art spaces where she would have a little tent set up with a sandwich board announcing the Garment Solidarity Project, and it would just be her there with her sewing machine. 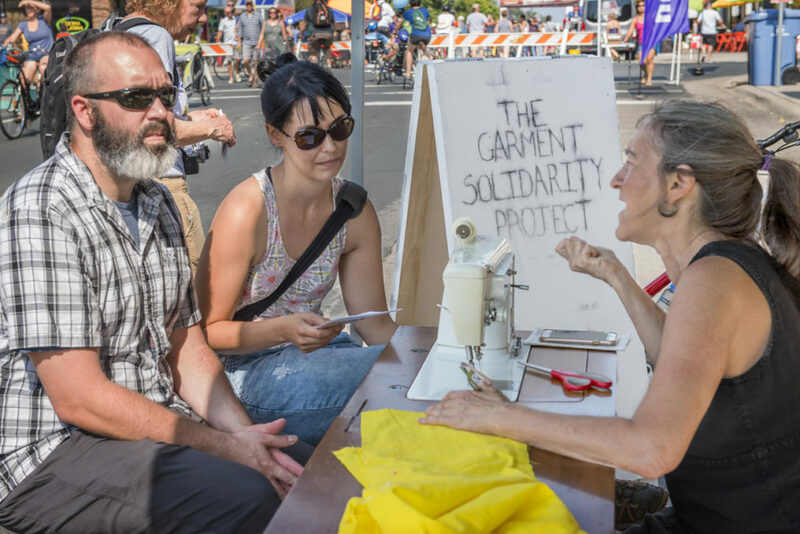 The Garment Solidarity Project. Photo by Kristine Heykants. Though she’s created several projects out of it already, Breen doesn’t feel like she is quite done with her Bangladesh work. She says she continues to feel a sense of obligation and responsibility around it, especially because so many Bangladeshi women were so generous in sharing their stories with her. “All these people really gave me a great sense of having a responsibility to share their stories and to honor them,” she says. She went back to the Goodwill Outlet and this time picked out items with lots of patterns and colors. Now she is focused on taking these clothes apart and installing segments with different pieces put back together. She calls this project Piece Work, and it is meant to make the labor in our clothes more visible—it is all done in piecework in a factory, with women in one row all sewing pockets and those in another row all making button holes and on and on. She believes that having visual reminder brings those ideas home for people, and she hopes that it moves people to action and makes them think twice about what they can do—and what they buy. That said, the whole system of global capitalism won’t just unravel like so many loose threads, and Breen understands that. 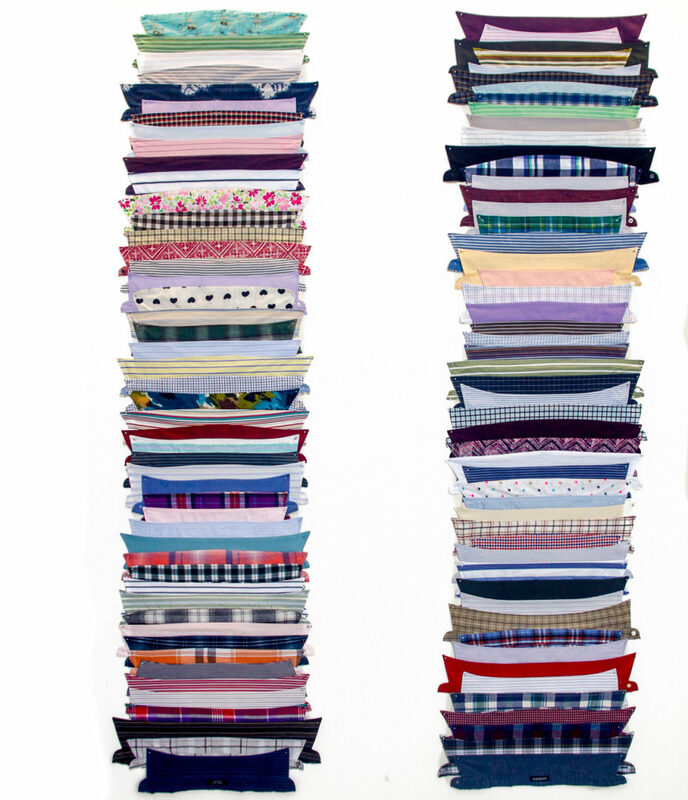 Piece Work: “Collars.” Photo by Justin Allen. As part of the Garment Solidarity Project, Breen created a brochure with 20 relatively easy things (listed below) that a person can do to have a positive impact on the garment industry in an effort to make such actions more accessible to people…people who otherwise agree that the working conditions of garment workers in Bangladesh factories are a humanitarian crisis, but who truly don’t know what they can do about it. Download an app that will help you buy more ethically: Check out Good Guide, Ethical Barcode, Good on You, and Not My Style! Contribute to an organization that works with garment workers: Labor Behind the Label, Clean Clothes Campaign, and International Labor Rights Forum are a few good ones! Create your own style, not what is marketed to you! Embellish an unloved item of clothing with new trim, a brooch or a patch. (1) How do you like to collaborate? I like to collaborate without having a clear idea of what the end product is going to look like. Having a give and take and being open to whatever the final result is going to look like is a really important part of collaboration. (2) How do you a start a project? The main way I like to start a project is by drawing, or running paper through my sewing machine, and that’s where ideas start to form. The other way is riding a bike. I’m a cyclist, and sometimes I get my best ideas while on my bike. (3) How do you talk about your value? I think about ethics and the values of social justice a lot. That partly comes from my identity as a Jewish woman. Being Jewish has grounded me in a strong sense of social justice. I have reasons to give back because I’ve had so much privilege and access in my life, and I am aware of that privilege. In all of my work I’m interested in questions of social change and social justice. I started out as a community activist and did social justice work—I’m a nontraditional student, I didn’t get my MFA until I was in my 40s—so I felt I really needed to bring politics into my work. A huge part of my work is interested in how art is political and being political in making it is really important to me. (4) How do you define success? Having people tell me they felt really moved by my work, but even when people say, “I was shopping and I actually thought about whether I should buy something or not”—that’s what I want. I want the thinking. I want it not to just be a moving experience but something that stays with people enough that it impacts their behavior. That is really impactful to me. People seeing an artwork that actually impacts their behavior is a huge success to me, in everything from being willing to sign a petition to donating to an organization. (5) How do you fund your work? I feel really lucky because I have a full time job teaching at a local community college. I have to say I love teaching. The community college is a really vibrant, rich environment. We’re dealing with so many issues of racial conflict on campus—we have refugees and immigrants and rural white Trump supporters—so sometimes I feel the most radical thing I’m doing is getting students who are so different to talk to each other. That gives me some freedom so that I don’t have to worry about selling my work. I’m a single mom with two kids so I have to have this job and I feel really lucky to have this job. I do get jealous sometimes of non-employed people, but I could not go without security. Also, Minnesota is a great place for artists. We have a lot of funding for artists and I’ve been able to get several grants that have allowed me to buy materials and pay myself for the summer so that I don’t have to teach. I can buy a sewing machine, do some publicity, and pay someone else to design a brochure. There are really great funding opportunities in Minnesota, and then it all builds on each other. There is such great dialogue here and it’s just a great arts community. Because there’s a fair amount of funding there’s not as much competition. I feel like everyone is just happy because someone got the grant. They’re not jealous; there are other ways you’re supported by the community having funds. We could have more galleries and spaces for people to show their work, but by and large there is a fair amount of opportunities available. Or we create our own opportunities. The Garment Solidarity Project I can take it anywhere; I’m mobile. It’s not just pieces hanging in a gallery—it’s easy to transport and take places. There are a lot of really innovative projects happening here. I did a project for Northern Spark called Behind the Seams: we hired people to be sewers and paid them $15 an hour. They wore aprons that said “We’re making $15 an hour.” They were repurposing old T-shirts, sewing patches on them that said, “This shirt was made with human hands.” We were selling these repurposed T-shirts for three cents because that’s how much women are paid to make these T-shirts. It was impactful in demonstrating how ridiculous the prices of our garments are. People would walk down this row between the sewers working on their machines, and we would ask them, “What would do to make garment industry workers’ lives better?” I got a $5,000 grant to do this and pay people. There is just a lot of create and innovative spirit in how we approach art in the Twin Cities.